After turning around last weekend, the weather remained stable through the week and Ravi, Sandeep, Bond, Vinay and Arun made the most of it. According to Arun nice thermals and benevolent winds had them gaining height at Tower Hill and heading back home to Native Place each day. Bond held the record of the week as he reached Native Place 3 days out of 4. 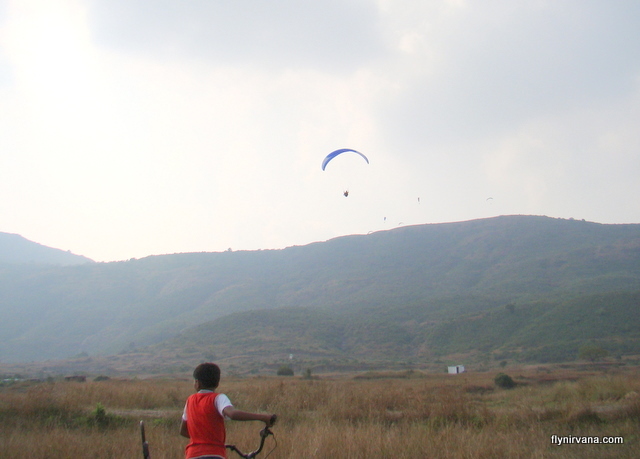 They were all excited and happy to have the thermals and the Kamshet skies to themselves. On Saturday we got to the site early to find it very hazy and the wind strong but lessening. By the afternoon everyone was airborne. The winds were switching on and off and gliders were consequently spreading out and flocking back to the ridge to gain lift once more or landing out and driving up again. I landed after an hour or so and hung out in the landing field with Chicco. It was the last flying day for the Swede pilot group. In the span of a week they have bonded with the friendly local kids who pack your wings. It was entertaining to watch many paraglides come in to land and kids running excitedly towards them to secure packing or simply having fun interacting with the pilots. A festive mood prevailed and I enjoyed every moment of it. Sunday saw us ( Sanjay & I) head out to the training hill enroute to Mumbai, to pick up our son Sunith who had just completed his 30th solo flight and was pretty pleased with himself.